Posting a bit late to day as we had company. My image is fitting for today since it is pretty steamy outside. 90s and very windy today. Ugh. 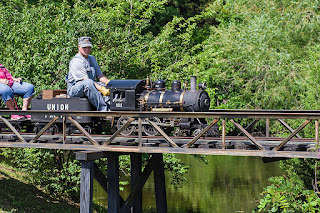 This is from last weekend when I went to the 12 inch scale railroad I get to play at. This locomotive is my favorite one to run. When I took this image it was being run by another of the people who get to come play and he was just heading over the main bridge on their setup. The pond was quite full that day due to all the rain we had been getting and made for a nice scene I thought.